Is your home ready for the seasonal change to cooler weather? As we transition away from summer, there are a few things homeowners can do in order to set themselves up for a great fall season! Carefully inspect your roof for water leaks. Look for deteriorated, missing or damaged roofing material -- these can be signs of water leakage and need to be addressed immediately. If you've been wanting to add to your landscape, start planning and gathering plants now. Fall is a great time to drop many perennials, bulbs, shrubs and trees into the ground. Some leaves may have already started to fall in your neighborhood. Start the autumn season off right with clean gutters; this will make removal easier in the weeks to come as the trees bare all of their leaves. The days continue to get get shorter. In order to maximize your home’s natural light through the end of the year, give your windows a thorough washing. You likely have a number of summer items to put into storage. While it might be tempting to just toss everything on the garage floor, clutter can be hazardous as well as an eyesore, and will only cause headaches in the long run. Your furnace has been sitting all summer long; go ahead and fire it up on the first mild temperature day. This way, you might be able to identify (and fix) an issue before extreme weather hits. No issues with the furnace? Great! Go ahead and schedule your fall tune-up to ensure you are operating at peak efficiency for the heating season. Hopefully these tips will help bring comfort to your home as we begin to spend more time indoors. 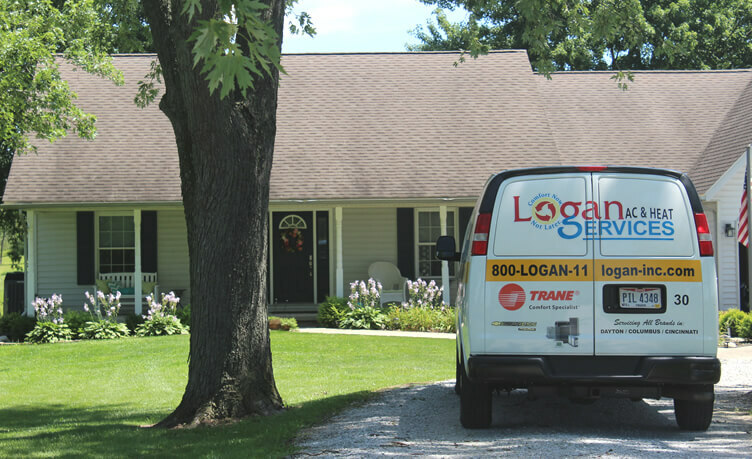 For heating and cooling repair or replacement, call the fast, friendly team at Logan Services in Dayton, Columbus and Cincinnati!